This weekend just gone, our town of Portishead celebrated its annual ‘Window Wanderland‘ event, where people – whether individuals, shops or community groups – create a lit display in their window that others can wander around and admire. And my fellow volunteers at the lifeboat station and I were, as usual, keen to get involved. We wanted to come up with something that was specific to the RNLI, while recognising our distinct lack of artistic talent. And the photo shows what we came up with. Which is fairly nice, I think. In fact, our lifeboat operations manager was so taken with it that he’s considering getting someone with more talent than me (it’s a fairly large pool) to paint it properly onto the windows. 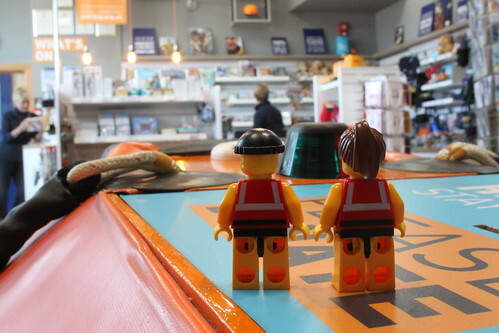 In additon to our window display (and a much superior display in the windows of our lifeboat station shop), we also opened up the doors and had volunteers on hand to show people around. And around eighty visitors showed up to say hello, which was great, especially as it was quite nippy out. One visiting family in particular really made my day. 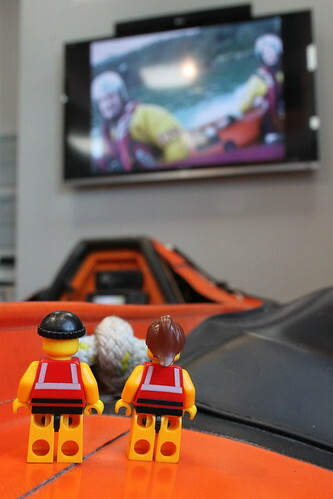 A couple with three young children, they’d raced up to the lifeboat station and has listened enthralled as I showed them the boat, the tractor and the associated bits of kit in the boathouse. 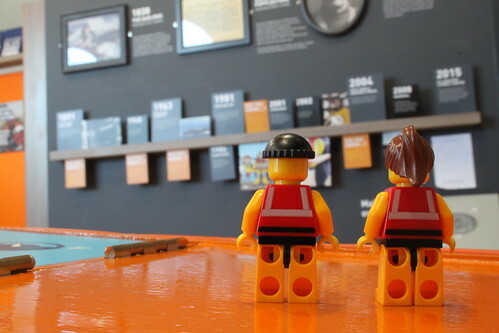 As they were preparing to leave, one of the parents asked their daughter – who must have been about six – if she’d like to be on the lifeboat crew one day. She looked sad for a moment and explained that she couldn’t, as she was planning to become an engineer. I told her that our crew members are all volunteers and have actual day jobs in addition to being on the crew. So it would be no problem at all for her to be an engineer and an RNLI crew member. Her face lit up and she said that, in that case, she would definitely sign up when she is old enough. Just a fleeting conversation, to be sure. But it really made my day. And made the three hours I spent cutting out cardboard letters absolutely worthwhile. We’ve been away for a little while. Sorry. Work, family life and a new puppy (yay!) have meant that things have been a little hectic here at Crew HQ. But we’re back now. So keep an eye out here for news about what we’re up to, as well as essential coastal safety tips. And remember that we’re on twitter and facebook, too. Have fun. Stay safe. And respect the water. Research indicates that roughly one in four adult victims of drowning have alcohol in their bloodstream. And it is at Christmas time, with its office parties and general merriment, that people can be most at risk. 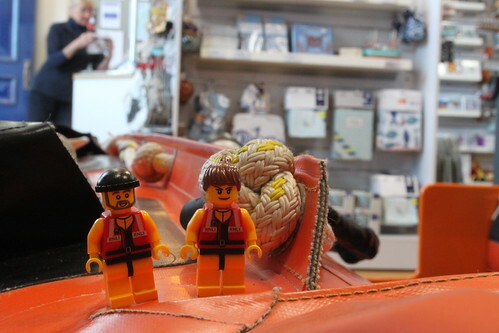 In the West of England, where the little guys are based, several young people have drowned tragically in recent years. Including one in Portishead Marina, just yards from the lifeboat station. Because of this, the little guys are delighted to support the Royal Life Saving Society‘s ‘Don’t drink and drown’ campaign. The campaign, which runs from 4th to 10th December, warns drinkers to steer clear of walking by or entering water when under the influence of alcohol. Alcohol lowers inhibitions, leading to impaired judgment, which means you are more likely to take risks and get into trouble. It also slows down your reactions, numbs your senses and makes simple movements much harder. So just because you can drink like a fish, it doesn’t mean that you can swim like one. And if you do get into trouble, you may not be able to get yourself out of it. Falling into cold water, especially in the dark, could mean that a great night out ends in a tragic, terrifying and lonely death. To find our how you can support the RLSS’s ‘Don’t drink and drown’ campaign, and potentially help to save a life, go to their special campaign website. And if you go out for a drink this Christmas, please stay away from the water.